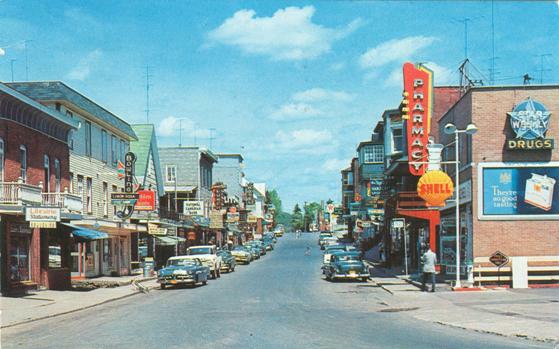 This is is a postcard of Ste-Agathe-des-Monts which was mailed in the early 1960s, though the image might actually be from the late 1950s. Ste-Agathe is located in the Laurentians, and is part of the modern administrative region called Les Laurentides. The Laurentians are best known to outsiders as a great skiing region. I bought this postcard because the SHELL sign is one that I used to see in my childhood. Here’s a message that PostcardKris of Postcard Images: 100 years of life, love and mystery left in the comment box below. I guess we know where to get our cars dated now!. And here’s a great new message from Michael Litvack. Thanks! The defining way to date this St. Agathe postcard is to locate the Laurentien Bar restaurant. I believe it moved from the right side to the left side about 1952. Whistles on the cash sold for one cent, Bazooka gum for 2 cents,,,and the Smokeburgers and vanilla cokes were just great ! Smokeburgers??? machine sliced commercial smoked meat formed in to a patty, and the grilled and put in a hamburger bun, with mustard. It was 60 years ago…yummy! That’s a nice collection of vintage signs and cars on that street. Close as I can tell, the first parked car facing the camera is a 1954 Ford Crestline Skyliner. I can tell by the very distinctive small parking lights under the headlights. The dark car on the right pointing away from the camera is late 40’s. All the cars look like late 40’s, early to mid 50’s. My best guess is the photo for this postcard was taken in the mid-fifties. The Shell sign and other ad signs bring back memories for me too. Thanks for posting. bonjour,clic par hasard sur cette belle carte postale,et sur le patronyme LECLAND dans le recensement de 1901.
passionné de généalogie,sachant qu’il existe une famille au canada avez d’autre renseignements sur ces personnes. Bonjour Michel, Merci de votre commentaire! Etes-vous de Ste-Agathe des-Monts? J’habite en France à Orléans et je recherche tous ce qui se rapporte au patronyme” Lecland”. Si vous pouvez chercher dans cette liste de recensement de 1901 si y il a d’autres renseignement (dates de naissance, de mariage conjoints ou enfants). Ou m’indiquer comment faire pour chercher. the defining way to date this St. Agathe postcard is to locate the Laurentien Bar restaurant. I believe it moved from the right side to the left side about 1952.Whistles on the cash sold for one cent, Bazooka gum for 2 cents,,,and the Smokeburgers and vanilla cokes were just great ! Smokeburgers?? ?machine sliced commercial smoked meat formed in to a patty, and the grilled and put in a hamburger bun, with mustard. It was 60 years ago…yummy! Have a look at the painting that I just finished based on this old postcard. Everything is as in the postcard, except for the Coca-Cola sign that I added. Fine Art America. I would post it here, but I don’t know how!